This Selfie Of Shahid Kapoor With Wife Mira Rajput Proves That They Are Madly In Love With Each Other! 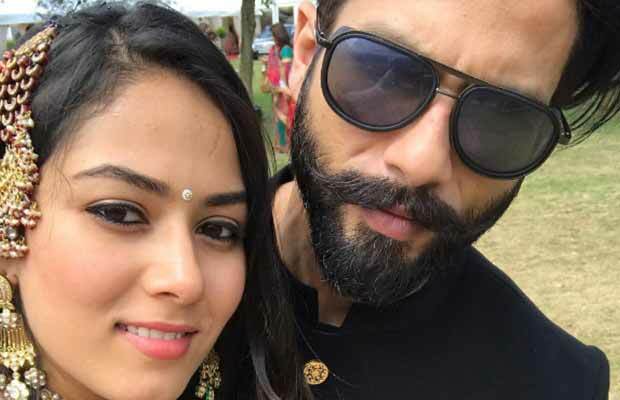 Shahid Kapoor posts an adorable selfie with wife Mira Rajput. The Bollywood actor Shahid Kapoor and his wife Mira Rajput always gives us couple goals. They are indeed one of the most adorable couples in B-Town. The two of them often get snapped in town, while they are out for a lunch date or just for shopping. This time the actor himself has posted a selfie with his wife, as the two of them were enjoying a friend’s wedding in London. Both Shahid and Mira had adorned a royal look for the wedding. Their photo is an adorable one and it shows how much the couple is in love with each other! The couple has returned to town after attending the wedding. They were snapped at the airport walking hand in hand. On the work front, Shahid Kapoor will be seen in Sanjay Leela Bhansali’s Padmavati. SLB’s historic film Padmavati features Deepika Padukone as Queen Padmavati opposite Shahid Kapoor who will be seen as her husband, Rawal Ratan Singh. Ranveer Singh portrays the character of Alauddin Khilji in the movie. Rumours are also rife that Mira and Misha might soon be having their Bollywood debut together. Previous articleIs Taimur Ali Khan More Like A Kapoor Or A Pataudi? Kareena Kapoor Khan Answers!